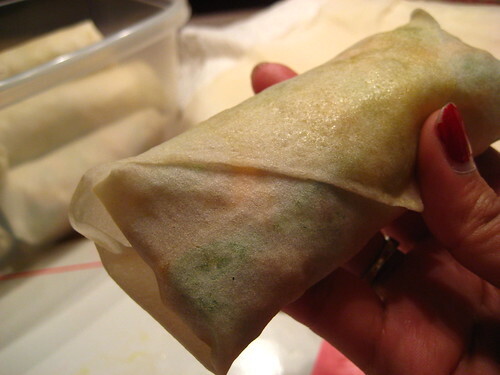 For a complete how-to and recipe for rolling and making vegetable lumpia (lumpia prito), read my post How to Make Lumpia. I have never met a person who has tried Filipino lumpia and didn't absolutely love them. I mean, who doesn't love eggrolls? 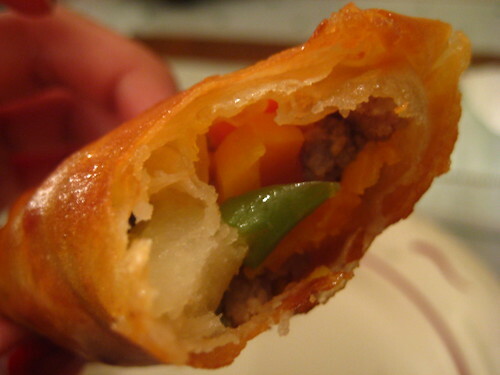 Lumpia Shanghai are the eggrolls most commonly served at Filipino parties, and usually the first reaction that non-Filipinos have upon seeing them is, "Whoa, they're so little!" Yes, unlike the big fatty Chinese eggrolls that most people are used to, Lumpia Shanghai are thin, bite-size, and oh-so-cute. They also have a tendency to disappear within mere minutes of being served. Oh yes, they're damn good. Fresh lumpia is less commonly served, at least at my house. 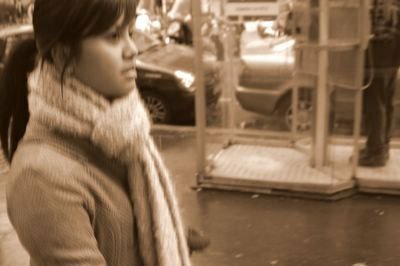 I was a child the last time I had fresh lumpia, and all I can remember is the peanut sauce and the fresh, crisp texture of veggies. I've asked my mom to make them several times, but still no dice. 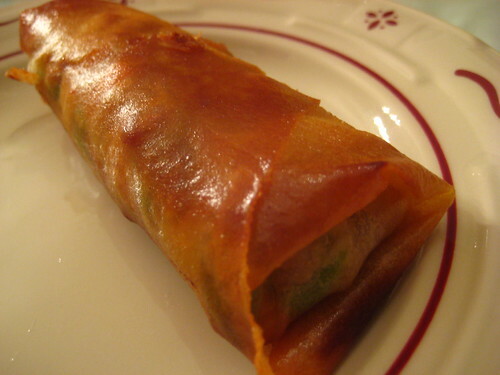 My favorite is vegetable lumpia and is the feature of this post. They're about the size of Chinese eggrolls (but waaaay better, of course! 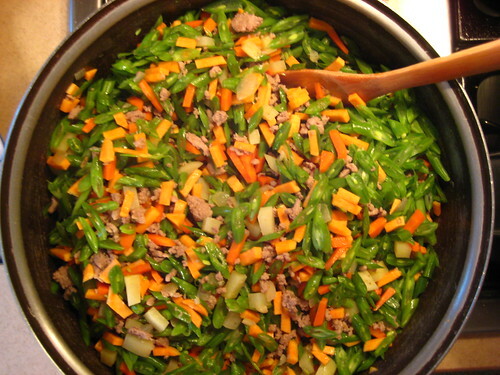 ), three or four can easily fill me up as a whole meal, and they're not complete without spooning a mixture of soy sauce, vinegar, garlic, and pepper over each crispy bite. Lumpia is pretty easy to make, but it takes a lot of time and work to chop, cook, and cool the vegetables, then wrap the eggrolls. Which explains why Mom only makes lumpia when others promise to help out. Until now, my duties have been limited to chopping, separating the wrappers, and helping wrap and seal the eggrolls. Last weekend, I decided it was time to learn to do the entire process on my own. 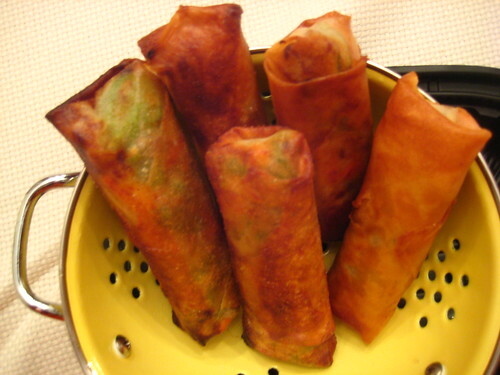 Although it's called vegetable lumpia, it's not really vegetarian. My mom added ground turkey, along with green beans, carrots, sweet potatoes, regular potatoes, onions, and garlic. Cooked it all and tossed with patis (fish sauce), then allowed the veggie mixture to cool. And now, the best part: frying and eating! 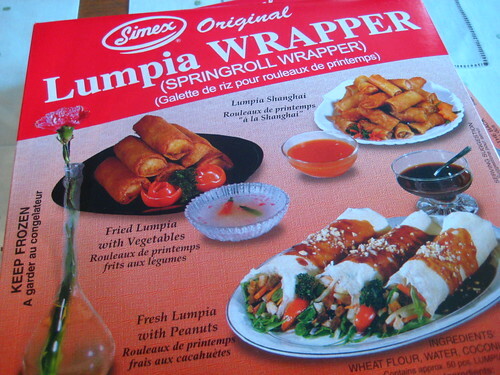 *By the way, the wrappers pictured above are actually best for Lumpia Shanghai, as they're thinner and can hold only a small amount of filling without tearing. I was fooled by the picture on the box and bought these wrappers, thinking they'd be fine for vegetable lumpia. My mom informed me that thicker wrappers are more suitable for bigger eggrolls. We ended up double-wrapping them. Oops. I have made these a million times, however I make the vietnamese style but I cannot for the life of me get them small like the lumpia which is what my hubby wants! What is the secret? 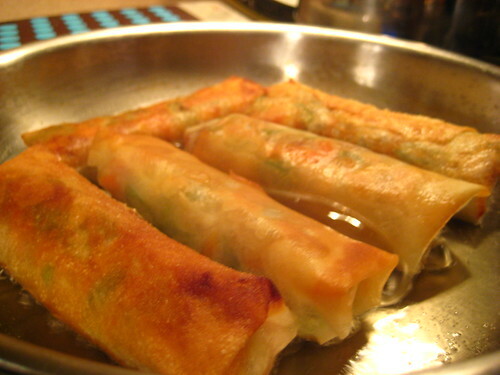 Are lumpia shanghai those really thin ones that look like cigars? They look fabulous! Su-Lin - Yeah, they do kinda look like cigars! And they're sooooo addictive. Thanks for dropping by! I have a hard time peeling the lumpia wrapper. Is there some tricks behind it. Seems like you were able to peel it easily. Cozy up with a Shepherd's Pie. At home: Dad makes eggs and rice for breakfast.